Paella is Spanish for friendship? I think so. Well, it should be. In Texas, the term “Spanish” was sometimes used (euphemistically) to mean Mexican, or Mexican American. Restaurants serving Mexican food sometimes called themselves “Spanish” as in Spanish Village or Spanish flowers. Not so much today. 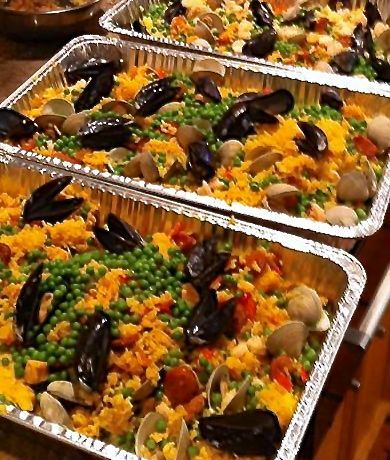 We enjoy festive Paella without ever confusing it with any of our delicious Mexican regional dishes that showcase chicken in a skillet like Calabacita con Pollo and, my favorite, Arroz con Pollo. About seasonings: I don’t use any laurel leaf here, nor the usual thyme. If you want to use use bay leaf in your paella, keep in mind that the Mediterranean bay laurel leaf is a different species from two other laurel leafs, the Mexican laurel leaf and the California Bay Leaf. I suggest you try the Mexican one for a more subtle flavor. All of my Chicano Chef friends have their own very personal version of Paella. This Paella recipe is one that I’ve made personal simply by using Texas smoked sausage and Texas Gulf coast shrimp. Brown the sausage first and then use the drippings to brown the chicken. Deglazing leaves you with a robust flavor addition to the cooking liquid. It’s a beautiful dish for parties, friends. 1. In a saucepan, heat the water and chicken stock, add the saffron threads and garlic and steep for 5 minutes. 3. On high heat, add the chicken and onions and cook until the chicken is slightly golden and the onions translucent, about 2-3 minutes. Add the wine and deglaze the pan, scraping with a wooden spoon to dislodge all the brown bits and evaporate most of the wine. 5. Add the peas and shellfish, pressing the shellfish down into the rice and liquid. Bring the liquid to a simmer, cover and cook for 5 minutes, until the shellfish is cooked. It is ready to serve. Gather round, spring open the cover and enjoy the lusty steam and aroma. Serve with the lemon wedges. FYI, you may also want to try this Paella Vegetariana. As they say in Spain, ¡Buen Provecho!